Except analyzes supply chains for their sustainability impact, reviewing financial, logistical, and social factors in addition to standard biophysical metrics. In our globalized economy, there is hardly a company that can consider itself independent from the international flow of materials, products, services, and people. With goods exchanging hands so frequently, we often lose insight into the true costs, risks, and environmental impacts of the things we purchase from this global exchange system. 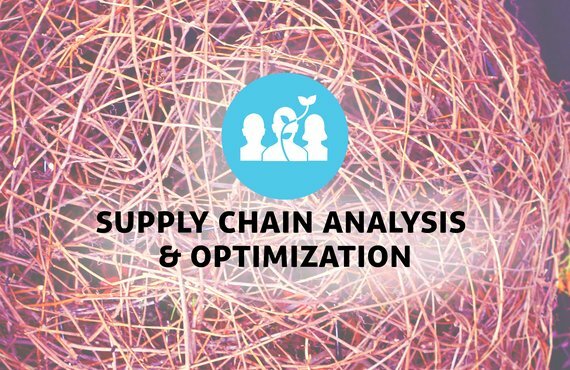 Supply chain analysis sheds light on these complex interactions and what lies hidden between them. From these, we can determine effective steps towards impact improvement of your organization as a whole, by optimzing the supply chain. Supply chain mapping is the first step in this process. It consists of mapping the supply chain both upstream (suppliers) and downstream (customers and consumers). These are often translated in beautiful visual maps that allow teams to oversee the whole supply chain. They create oversight and insight. From this qualitative mapping, we determine where the largest imapcts are using the Symbiosis in Development (SiD) framework. We prioritize big impacts to quickly find potential improvement areas. Once we know the major impacts, we can set out an improvement pathway/ By looking at the whole supply chain, we can find ways to improve performance by managing the stakeholders, suppliers, and customers. This often saves time and money compared to only looking at the organization's own impact, and can yield better results. Sypply chain mapping and optimization can be part of a larger trajectory of sustainable organizational transition. rerad more about our A to Z programs here. The country CO2 free in 2040? What key projects are necessary to make the Netherlands CO2 neutral in 2040? That was the central and massive question put before Except and Posad by the Dutch ministry. By applying network and system-analysis a surprising single answer was found: a more transparent, decentralized and accessible data-system is needed to make this happen. This research project investigates how the city dweller influences the food system. It investigates new disruptive developments, and proposes actionable steps forward to improve consumer connectivity to the food system. This improves the relation between actual demand for healthy and honest food, and the food system at large. The research booklet is downloadable for free (in Dutch).